Create a Far East theme in your landscape with pagoda styling of the roof, large shingles and copper accents. East meets best in this quietly dazzling home guaranteed to bring beauty and harmony to your garden and birding environment. While a graceful combination of shape and color is what makes this artful abode such a pleasure for the eyes, meticulous attention to every construction detail is what makes it home for the ages. Wherever you go, go with all your heart, Confucius said. 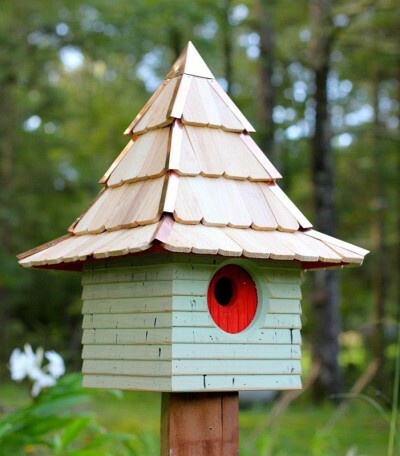 This enchanting house will bring you and your birds home with hearts full of happiness.Your new bird home may be mounted to a 4 x 4 post provided by you. The mounting plate is included. A removeable back disc make for easy seasonal cleaning. Made in the USA!